Cobalt concentrates are often leached with an acid such as sulfuric acid. An alternative leaching process of using matte is suggested. Cobalt concentrates are first converted to matte, enriching their major elements of Co, Cu and Fe, and the matte is treated by sulfuric acid pressurized leaching. The Co concentrate includes Co oxides as valuable minerals, whereas Co, Cu and Fe exist predominantly as sulfides in the matte. The effect of experimental factors such as oxygen partial pressure, sulfuric acid concentration and sulfur content in the matte on the leaching efficiency of Co is investigated. 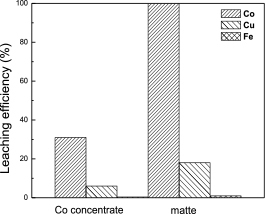 The presence of oxygen as an oxidizing agent improves the leaching efficiency of Co. Sulfuric acid concentration of 0.19 M is sufficient for the full dissolution of Co from the matte in oxygen atmosphere. A higher sulfur content in the matte enhances leaching rate of matte slightly. The leaching results are well matched with physicochemical characterization of Co concentrate, matte and residues. This alternative leaching process using Co matte could lead to a higher Co leaching efficiency than the direct leaching process using Co concentrate.